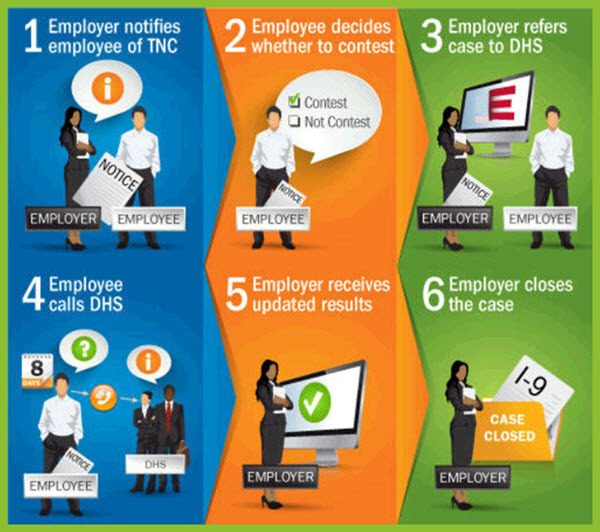 E-Verify cases can be determined to be a Tentative Non-Confirmation (TNC) by the Department of Homeland Security (DHS). When this happens, it can be confusing but it does not need to be with OnboardCentric. You will know if your employee has been tagged as a TNC by reviewing the E-Verify section, Work With > E-Verify. 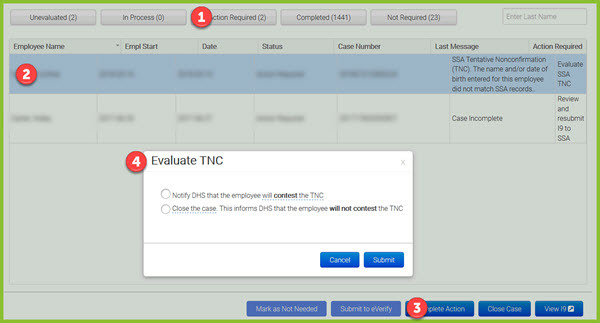 Employees identified as a TNC will be in the Action Required tab. It is important to know what is required when an employee has been identified with a TNC status. Here is a graphic from the United States Citizenship and Immigration Services (USCIS) to help explain what is expected. Step 2: After your employee has reviewed the TNC Notice they will decide to contest or not. Step 3: You will submit your employee's decision through OnboardCentric. Step 4: Ensure your new hire contacts the DHS to contest the TNC. Step 5 & 6: Review updated results and close case through OnboardCentric.